3 November 2012, Clayton Christensen, whose earlier works I have found inspirational and illuminating, published an article in the New York Times—”A Capitalist’s Dilemma, Whoever Wins on Tuesday“—that starts with a reasonable premise, and veers hopelessly off course. Fair enough. That is a very reasonable question, and it is a very reasonable expectation that Americans will keep asking it. The Fed has been pumping more and more money into the economy. The value of money is measured by the ratio of units in circulation to the value of stuff. If the number of units in circulation increases faster than the quantity, value, or both of stuff, then prices rise. Capital is the long-term means of production: drill presses, trucks, robots, etc.. The Fed doesn’t have any of that, and Fed governors are not in a position to command others to make such things available. The Fed lends money to the US Treasury, buys toxic assets from commercial banks, and regulates banks. It isn’t a hardware store. Now, if one is sitting on a lot of money that one can convert into capital assets, then one might adopt the financier’s habit of referring to that money as capital, but one should avoid conflating fiat inflation with the means of production. Firms are supposed to keep pools of cash as a kind of self-insurance policy against slow economic times. We call this ‘working capital’. When the future is even scarier than normal, the prudent thing to do is to hold more cash. The ‘Fiscal Cliff’, Pres. Obama’s political rhetoric expressing open disdain for those who are wealthier than he, the unknowable effects of Obamacare, the ongoing transition away from a capital/labor economy toward a service/knowledge economy, and the specter of another decade of ‘Bush’s war’ are enough to render all expectations of the future little more than random bets and wild guesses. And, no one gets fired for playing it safe. So, until things settle down, executives play it safe. Does Prof. Christensen believe that fund managers have piles of big, canvas sacks with dollar signs on them, filled with cash… like Scrooge McDuck or the dapper little fellow from the Monopoly™ game?!? The money is invested somewhere, most likely US Treasury debt, because the US Treasury has a reputation of always paying its debts… even if it has to print more money to do so. In these highly uncertain times, the safest bet is the safest bet. Sadly… no, no, no, and no. Build: Factories are increasingly automated, and when meat-that-talks is needed, one hires labor where it is cheap; i.e. Latin America, Southeast Asia, and increasingly Sub-Saharan Africa. Distribute: DHL, FedEx, UPS, already have that pretty well covered. Service: What is that? Throw it away and buy a new one. Except that [o]nly 35 percent of hybrid car owners bought a hybrid again when they purchased a new vehicle in 2011. This one is spot-on. It is unfortunate that Christensen did not make it the centerpiece of his analysis. Peter Drucker answered this question in Post-Capitalist Society , which was written nearly twenty years ago, and reads today like a play-by-play account of what happened in the 1990s and 2000s. Also, the total value of goods manufactured in the USA continues to exceed the value of goods manufactured in China. No one knows where the ‘jobs’ of the future will be. Social engineering always fails. In the 1960s, it was plastics; in the 1980s, software development; in the 1990s, Dot.Com… No one knows what it will be next decade. It might have made sense a century ago, when technology changed slowly, to make it costly to change plans quickly in response to new information, but Christensen’s advice in a highly dynamic—even chaotic—integrated global economy would create an incentive to keep sub-optimal plans running beyond their use-by dates. This suffers from two fatal flaws. 1) The universe does not end at the US border. 2) If capital gains represent a trivial portion of the federal budget, then eliminate the cost of collecting and enforcing them and call for their repeal. Leave the money in the owners’ hands, rather than seize it at gunpoint, if it is hardly worth collecting. Indeed, times have changed, but that does not mean that this time is different, as Christensen seems to assume. We are in the latter stages of a transition as profound as the 18th Century Industrial Revolution, from a capital/labor division—in which semi-literate proletarians drive industrial machines—to a knowledge/service division, in which skilled workers are the ‘capital’ and are not interchangeable. However, the wealthy will invest where they expect the greatest opportunities are, as has been the case since the Renaissance a half millennium ago. When princes, presidents, and parliamentarians create uncertainty, the wealthy will hunker down and wait until circumstances stabilize. Christensen started with the premise that the president and the Fed do not have the power to fix things, and then concluded that the IRS does have such power. This conclusion is counterintuitive. An alternative would be for presidents, princes, and parliamentarians to enforce transparency, and otherwise to mind their knitting, rather than concern themselves with affairs that are beyond their abilities. Wilhelm Röpke (1899-1966) is credited by many as one of the architects of the post-WWII German Economic Miracle, driven by the implementation of the Social Market Economy that is advocated by adherents of ORDO Liberalism, and associated with the Freiburg School of political economy. ORDO Liberals see a distinction between laissez-faire and Classical Liberalism that is very similar to what Karl Polanyi (1886-1964) describes in his book, The Great Transformation. Essentially, laissez-faire is about means and Classical Liberalism is about ends, and there is no guarantee that laissez-faire will lead to Classical Liberalism. Evidence includes cartels, ‘old boy’ networks, cronyism, Unconscionable Contract, etc., all of which can exist under laissez-faire, but are very different from the ends that Classical Liberals advocate. Some of the most repressive societies are those that have evolved in remote tribal villages, so far removed from formal government that it essentially does not exist. On the other hand, the opposite of laissez-faire, statism, has led to unfathomable horrors including the twin extremes of National (‘right-wing’) Socialism and International (‘left-wing’) Socialism, the Khmer Rouge, and numerous Middle Eastern dictatorships, along with watered-down versions of in Cuba, Myanmar (Burma), Venezuela, Zimbabwe, et al., ad nauseam. Statists see this not so much as a distinction between laissez-faire and Classical Liberalism, but as an inevitable consequence of laissez-faire, and they argue that government regulators and enforcers should achieve desired ends by whatever means are deemed acceptable. In post-WWII Germany, the heavy hand of government was used to create a social safety net for the socioeconomic bottom-most while allowing market participants to allocate resources. So long as individuals employed means and achieved ends that were acceptable to government regulators, they were left to do as they wished. When someone in power determined that either the means or the ends were unacceptable, government agents stepped in to redirect the resources. For the decade after the War, politicians and regulators steered the German economy down this middle way with some success, avoiding the excesses of command-&-control socialism at one extreme and the kind of anarchic chaos seen later in Russia following the fall of the Soviet Union at the other extreme. China’s rulers appear to be attempting to follow a similar path today. If politicians and regulators are united in their belief that Classical Liberalism is the ultimate end, and that the constrained laissez-faire of the market is the most efficient means to achieve that end, with occasional intervention, then an ORDO Liberal policy regime can work. There is, of course, no guarantee that subsequent generations of politicians and regulators will not err on the side of command-&-control, as happened in Germany in the last quarter of the 20th Century. Where individuals wield power, the danger always exists that they will use it in pursuit of personal agendas, even at the expense of the community as a whole. In other words, the danger today is not that the agents of a national government might tax or regulate a firm or industry out of existence, but that the executives of transnational firms and networks will enter into contractual arrangements that create artificial monopolies or otherwise exploit their positions to the detriment of consumers. Granted, Dominium is less of a concern than Imperium, but it is a concern, when it results in higher costs for those least able to afford them. At the extreme, executives gain a kind of sovereignty by being beyond the reach of any particular government other than the ones that they happen to be standing in. An example of this is illustrated in a recent Bloomberg story, “U.S. Studies Derivatives That ‘Game’ Tax Rules” that describes some of the difficulties that US legislators and regulators are facing in their quest to control the executives of financial firms and the participants in derivatives markets. A major part of the problem is the fact that all financial assets are either contracts or titles that derive their existence from individual agreements and social institutions. They can be transferred quasi-instantaneously; encoded, shredded, and stored transnationally; and accessed, reassembled, and decoded from any jurisdiction. The only things preventing the establishment of a peer-to-peer asset exchange that exists purely on the Internet are inertia and convenience. The tools and designs have existed for more than a decade. As long as the cost of the status quo remains less than the benefit, individuals will resort to status quo organizations, but if legislators and regulators raise the cost of doing business conventionally much more, then transitioning to something else becomes a viable alternative. Even in the absence of overt blundering, the relative benefits of technological innovations are growing at exponential rates, and the tipping over into a new order that is out of the reach of any national government probably will come no matter what politicians do in any particular jurisdiction. In such a world, the idea of a Third Way becomes untenable, as no national regulator or enforcer will be strong enough to compel laissez-faire to lead to Classical Liberalism. Where things will lead, like all else in the future, is unknowable, but it is not unimaginable. I will explore some possibilities in Part 2 of this essay. We can expect to see more articles like this as we continue the transition that began in the final decades of the 20th Century, from an economic order driven by capital and labor to one that is driven by knowledge and service, in which the capitalist no longer can be caricatured by a Dickensian factory owner, but instead by Scott Adams’s Dilbert, a highly talented employee with specialized skills, as Peter Drucker explains in his 1993 Post-Capitalist Society. Today, nearly a quarter-century on, we can look back to see how accurate Drucker’s predictions were, as Massachusetts Institute of Technology economists, Erik Brynjolfsson and Andrew McAfee, do in their 2011 Race against the Machine, and except for the specific technologies that Drucker cites, he was spot-on. If you can do your job from your sofa, then that sofa can be within walking distance of your employer’s headquarters, across town, or in Jakarta. If a robot, a piece of software, or someone in Jakarta can do your job, and you are in the Global North/West, then this would be a very good time to start thinking about a career change. There is no silver bullet here. All you can do is follow your heart and heed no one’s counsel but your own. The first few times out, you probably will fall flat on your face, but console yourself with the knowledge that 95% of science is wrong, meaning that most hypotheses are rejected during the experimentation phase. However, that 5% that works is where the frontiers of knowledge and experience are expanded. Follow your heart, and the money will take care of itself. Set aside 20% of what you spend on equipment, and six months’ rent, so that you can cover your bills during slow periods. If you create texts, music, videos, software, etc., give your work away for free. Network as if your life depended on it, and remember that it is a sad dog that wag its own tail. Always be learning, and be prepared to change product lines or career tracks about once every five years. If you won the lottery, what would you do with your day? You undoubtedly are not the only human alive who is driven by whatever your answer is. There is your business plan. Don’t draft revenue projections until you’ve made several sales; you cannot predict your cash flows, if you’ve never had any. And remember that innovation is what has not been done before. If the people around you think that your idea is ludicrous, then you’re probably onto something good; if others think that your plan makes sense, then the idea is already past its expiration date, and it is already part of the background noise. You will make mistakes and have regrets. You’ll get knocked down; get up again, and don’t let anything keep you down. By ‘crafts’ I mean anything that must be done locally, including landscaping, plumbing, home repair, nursing, firefighting, automotive maintenance, etc. If the idea of an activity’s being outsourced overseas is absurd, then it is a craft. You don’t have to be a hairdresser or manicurist; you can own the shop and hire hairdressers and manicurists. John D. Rockefeller famously said that he would prefer to have 1% of the money earned by 100 others than 100% that he had to earn himself. Whichever route you choose, do not let yourself get lulled into the false security of a ‘job’. No such thing as a job exists, as is easy to see, if one considers that, if one normally works 40 hours per week, and then starts pulling ten hours of overtime per week, one does not report that one has 1.25 jobs; similarly, if one’s schedule were cut from 40 to 30 hours per week, one would not complain that one had 3/4ths of a job. If you measure the value of your time in dollars per hour (or euros, or pesos, or yen, or yuan, or shekels, or lira, or dinar, or whatever), then you are saying that each hour of your time is as valuable as every other hour, which means that whatever you do to earn that money is ripe for automation. If you earn $10 or $20 per hour driving a cash register, keep an eye open for self-checkout stations to be installed where you work. Ditto paralegals and bookkeepers, secretaries and executive assistants, etc. The global economy is increasingly integrated, and borders are fading fictions. There is a cost for every benefit, and an opportunity hiding within every cost. And… the machines are lurking… watching… biding their time… Make your peace with them. 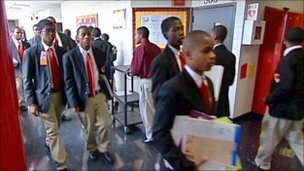 BBC News has a wonderful article on a charter school in one of Chicago’s roughest neighborhoods that is modeled on an English private school (referred to as ‘public schools’ in British English, oddly enough), and billed by its operators as “Hogwarts in the ‘Hood“. This reminds me of a John Stossel 20/20 special report from some years back called, provocatively, Stupid in America. I see reports and articles like these from time to time, and I want to invest accordingly! One part of me – the part that lives in South Florida – wants to start a school that caters to local high school pupils who would prefer to start their own businesses rather than seek employment in others’ businesses upon graduation. Another part of me – the part that teaches Finance and Economics – recognizes that schools require physical facilities (expensive), insurance (expensive), and admissions/recruitment (expensive), and that Pecuniology.com can provide the online component of a hybrid program that focuses on business education at an established charter school anywhere in the world (time consuming, but not expensive). Pecuniology.com has academically qualified instructors in Accounting, Economics, Finance, Information Technology, and Management, all of whom have many years of online teaching experience, and all of whom have experience with multi-ethnic and at-risk student populations.